The suicide rate for veterans is higher than for the general population. A veterans service organization placed 5,520 American flags across the National Mall in Washington, D.C., on Wednesday to raise awareness of veteran suicide. Volunteers with Iraq & Afghanistan Veterans of America (IAVA) placed one flag for each military or veteran suicide since the start of this year, according to new data released by the Department of Veterans Affairs last week. The last 20 flags were placed after a noon news conference, meant to highlight the 20 military and veteran suicides that occur across the country each day. The rate of suicide among the military and veteran population is 1.5 times higher than it is for the non-veteran population, IAVA said. “Too many of our men and women are dying," Paul Rieckhoff, IAVA Founder and CEO, said in a statement. “Every day, IAVA and our partners and allies are working to support hundreds of thousands of veterans facing transitional challenges after combat." 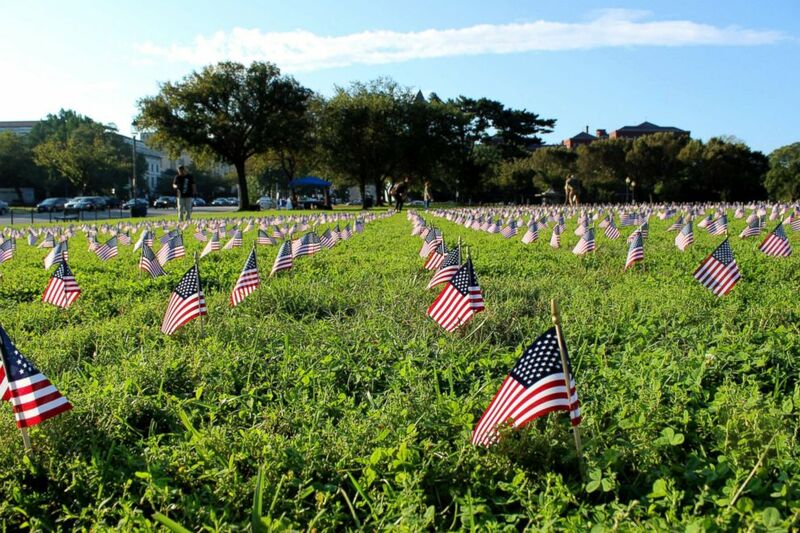 (Iraq & Afghanistan Veterans of America) Iraq & Afghanistan Veterans of America, a veterans service organization, placed 5,520 American flags on the grounds of the National Mall to honor every veteran and military suicide that occurred in 2018 so far. "We can’t fight this problem alone," he continued. "We need reinforcements of the greatest magnitude. We need a national call to action from the top that mobilizes all Americans. In response to this ongoing crisis, we need immediate action from the Commander-In-Chief, Secretaries of Defense and VA, and all Americans." In a survey of its more than 400,000 members in 2017, IAVA found that 58 percent of respondents knew a post-9/11-veteran who had died from suicide. In our 2017 member survey, 65% of respondents know a post-9/11 veteran who has attempted suicide. 58% know a post-9/11 veteran that has died by suicide. "There’s plenty of urgent news out of Washington this week dominating headlines," Paul Rieckhoff said. "This news is a matter of life and death and must not be overlooked. And unlike almost every other issue in Washington, this one could unite leaders of all parties." "We invite the president and all concerned citizens to join us on the National Mall to focus awareness, support and action on this silent enemy that is taking the lives of our fellow Americans every single day," he added.